Heavy-duty sewer hose lets you drain your RV's black-water and gray-water tanks at a dump station. Adapters (sold separately) are required for connecting to RV's waste valve. Sizing rings keep hose ends open. 15-Mil vinyl construction. Lowest Prices for the best rv sewer from Quick Drain. 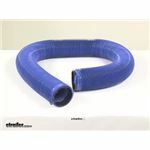 Quick Drain RV Sewer Hose - Blue - Vinyl - 15' Long part number D04-0057 can be ordered online at etrailer.com or call 800-298-8924 for expert service. Heavy-duty sewer hose lets you drain your RV's black-water and gray-water tanks at a dump station. Adapters (sold separately) are required for connecting to RV's waste valve. Sizing rings keep hose ends open. 15-Mil vinyl construction. Sewer hose lets you drain your RV's black-water and gray-water tanks at a dump station. Adapters (sold separately) are required for connecting to RV's waste valve. Sizing rings keep hose ends open. 8-Mil vinyl construction. 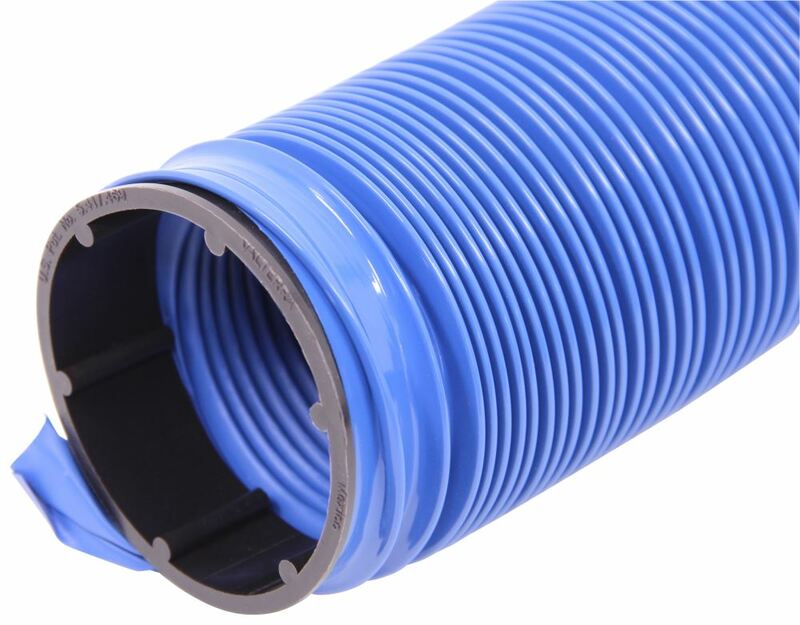 18 Mils of high tensile strength vinyl and a steel wire core make this RV sewer hose perfect for the full-time RVer. 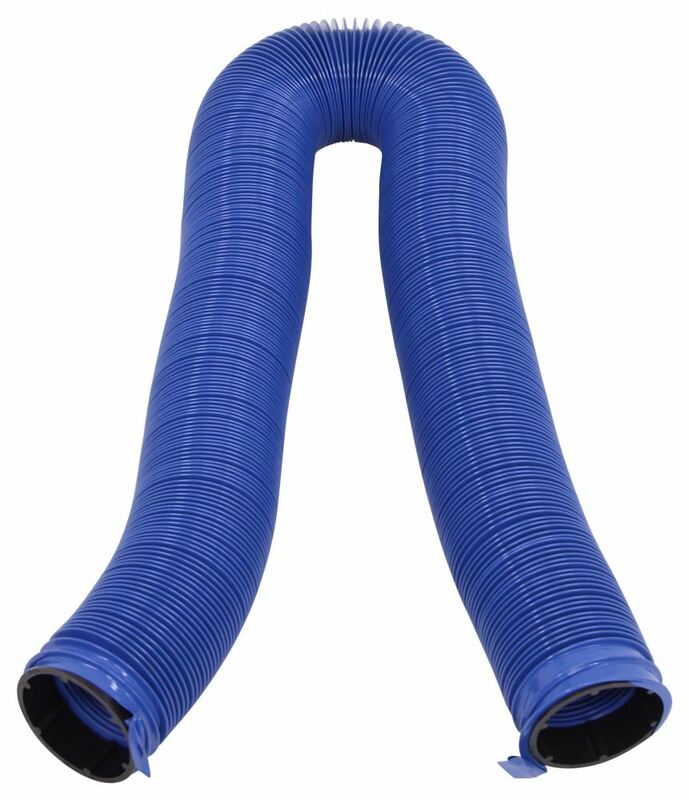 The 15' long hose compresses to 34" for easy storage. Pre-attached clamps secure all types of sewer hose adapters. 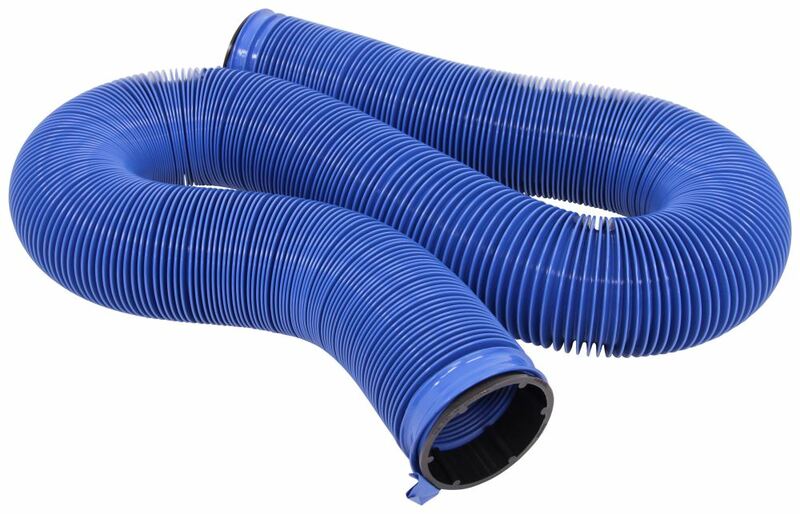 Heavy-duty, 18-mil vinyl hose is UV resistant. 4-in-1 Clear plastic elbow adapter lets you quickly connect hose to dump station and shows when tanks are empty. Swivel fitting rotates so you can easily secure hose to adapter. Today we're going to taking a look at the Heavy Duty RV Quick Drain Hose. This is going to extend up to 15 feet long. You can see how easily it extends or stretches and how easily it compresses for nice compact storage. It does include the sizing rings here at the hose ends. These are going to allow for hassle-free adapter installation. It's going to keep the hose ends fully expanded. To attach a fitting, just remove the sizing ring and attach the hose fitting as usual. Again, it does compress for compact storage. It's going to compress to an overall length of about 26 inches long. This is a 3 inch diameter hose that is blue in color. It's got a 15 mil, wire reinforced vinyl cover that's going to offer leak-proof connection. It makes the unit great for full-time or frequent RV-ing. It's going to protect against chemicals and corrosion and it's going to work well and remain flexible in all weather conditions. Now your hose fittings are sold separately. This will work with standard and easy coupler hose fittings. If you are in need of fitting you can check out some options here at etrailer.com. That's going to do it for today's look at the Heavy Duty RV Quick Drain Hose. Order: RelevanceNewestRating - High to LowRating - Low to High Heavy-duty sewer hose lets you drain your RV's black-water and gray-water tanks at a dump station. Adapters (sold separately) are required for connecting to RV's waste valve. Sizing rings keep hose ends open. 15-Mil vinyl construction. Do you have a question about this RV Sewer? Highest quality rv sewer for the best price. Most detailed, accurate rv sewer information available.